Sol A Sol Hostel, Lagos, Portugalia : Rezerwuj teraz! Here at Sol a Sol we have got everything! From in house we provide the ultimate Lagos experience. 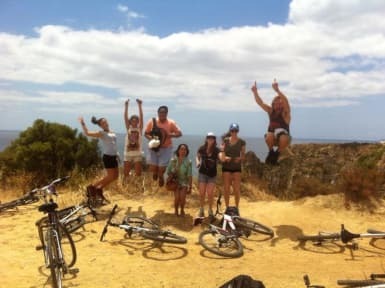 Be it trips to the Benagil Cave and exploring the west coast on one of our daily van tours, to off grid adrenaline fuelled mountain biking along the beautiful cliffs of Lagos to Praia Da Luz. Roof top BBQs? check! Pub crawls? check! Family dinner? check! What more do you want from a hostel! Sol a Sol is the best place for backpackers that like to combine fun times with a chilled vibe. What makes us so great? Our friendly, knowledgeable and helpful staff will make you feel right at home because we love to mingle with our guests and promote a happy and sociable atmosphere. We will let you in on special information and secrets that only we know. We are located in the heart of Lagos and you will be only a stones throw away from the beautiful beaches and most famous bars that bring contented travellers back year after year. As well as the whole range of activities that we have available, we have a huge LED tv in our lounge with comfy sofas, free wi-fi throughout the hostel, laptops to use and a wii for our more competitive guests! Come and join us and get involved in having, what we want for you to be, one of the best parts of your trip. - Boat Trips with our guests . - Night out in Lagos. - Two free internet stations .